Week 35... Still no baby. Haha! Ok, it's a bit too early yet, but I can't help being a little impatient! Now that the cot is up, the mobile is working and the hospital bag has been packed (all except for some spare clothes for me to wear home), I just can't wait any longer. Friends and family who have had babies keep telling me to put my feet up and do whatever it is I fancy (obviously within reason), like read a book or watch that box set of The OC, or attempt those peanut butter muffins because when the baby comes, you can wave goodbye to free time! But it's so hard to focus on anything else when this little one keeps kicking me and reminding me she is yet to emerge! I have gone against my better instincts and began obsessively googling early early labour signs to see if I could spot any. I had to literally prize myself away from the laptop because it's just such a pointless and silly thing to do. And I don't particularly want her to come too early! I want her to be perfectly cooked! I was packing my hospital bag last night and I have quite a lot of stuff!!! I'm sure I'm taking too much, but I guess it's better to be prepared! As I haven't been to antenatal classes (my choice, not advise), I don't really know what other women take to hospital with them... But should the woman in the next room run out of nappies for her newborn, I'm fairly sure I'll be able to supply one for her! Haha! As for how I have been feeling? Tired, tired, tired. Bit of a bad back, but then she is now the size of a beach ball so not really surprised. Little bit of morning sickness has returned and I get a bit of heartburn at night when I'm trying to sleep! But again, I really can't complain. I know I have been quite lucky through this pregnancy and that some women get all sorts of problems. If heartburn and the occasional bad back is what I have to deal with, then so be it! I love the cot! How gorgeous! 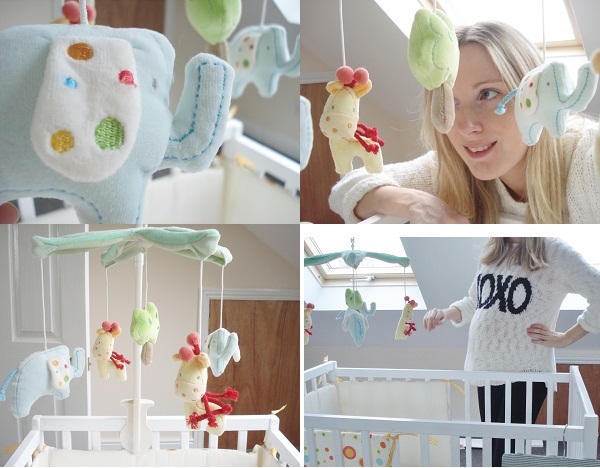 Have you done a little nursery tour as this expectant mummy would love a nosey! I can't believe you are 35 weeks! Has it flown! I'm 22 weeks today and I feel like I've ages to wait yet! Such a lovely cot & mobile! Not long now! I fully understand your inpatience - I am due a week tomorrow! Gary set up the Moses basket stand in our room today and now I just want my baby here NOW! A week! Argh! You must be SO excited! I dont know how I'm gonna cope when I get that near, I'll just be sitting on a towel waiting for my waters to break! Ha!